I made a new batch of Kombucha the night before my library copy of 'The Art of Fermentation: An In-Depth Exploration of Essential Concepts and Processes from Around the World ' was due. Looking through the section on Kombucha I was excited to discover that the mother can be very easy made into a type of gummy candy and as my recent Kombucha adventures left me with a rather large SCOBY mother to contend with I quickly started in on the process. The mother is cut into cubes - a process very similar to cutting raw chicken - which is very unnerving. The cubes are soaked in water, drained, and soaked again. Then they are boiled with water, drained and boiled again. This is to remove as much of the acidity as possible. Then the cubes are boiled with water and sugar. Once the sugar syrup starts to thicken the cubes are dehydrated (I used an oven because I wanted to hurry the process along, although next time I would use the dehydrator). The end result is very similar to flavourless gummy candy. I have read about individuals flavouring the candy with lemon and ginger which is something I would definitely do the next time I have an excessively large SCOBY. However, it may be a while before I use an extra SCOBY to make candy as I have read about cutting the SCOBY into thin strips and stir-frying it as one would do tofu. Additionally, this Coffee Kombucha seems interesting (but the mother can not be reused). Thanks for your insight! I'll have to try rolling in sugar after dehydrating. You will have better luck dehydrating after rolling the SCOBY in sugar - like when candying ginger, the sugar actually helps in the dehydration process, and helps to prevent pieces from sticking together. Thanks for the comparison to candy ginger. That's something I do frequently and your tips would really improve the visual of candied SCOBY. You'll have much better luck if you try it as she says, by rolling in sugar and then dehydrating, as if you dehydrate first you'll miss out on a couple of advantages. 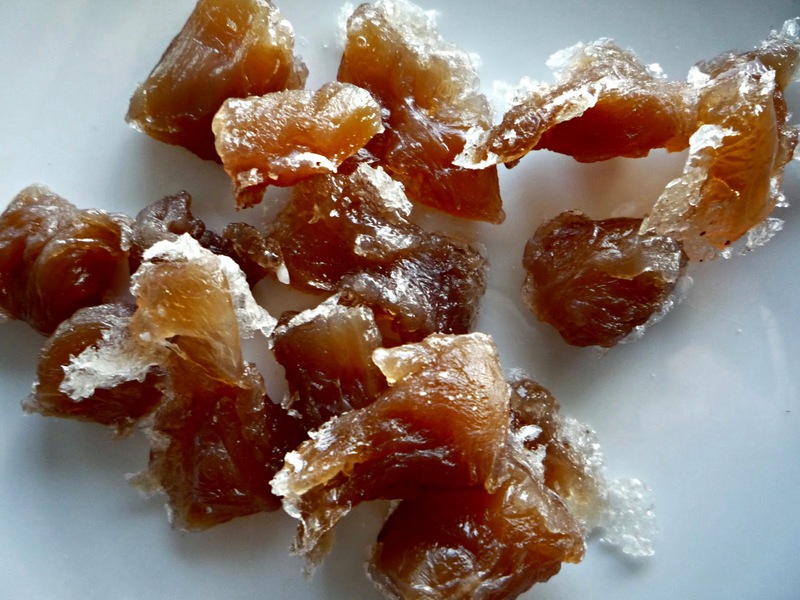 As with candied ginger, the sugar aids in the dehydration process, and the sugar will stick to the SCOBY MUCH better when it is still wet, versus after it has mostly dried. If you roll it in sugar first, the sugar coating will help additional sugar to stick better after dehydration, and you will get better results overall.